Egypt's electoral body will announce that Ahmed Shafiq is the new president on Sunday, local government sources say. Egypt's electoral body is set to announce Ahmed Shafiq as the country's new president on Sunday, local government sources claimed on Friday. According to a report on the website of the Egyptian newspaper Al-Ahram, Western diplomats in Cairo also said they have heard similar predictions from Cabinet members over the last three days. A source in the current government told the newspaper that Shafiq will be declared the winner with 50.7 percent of the vote. 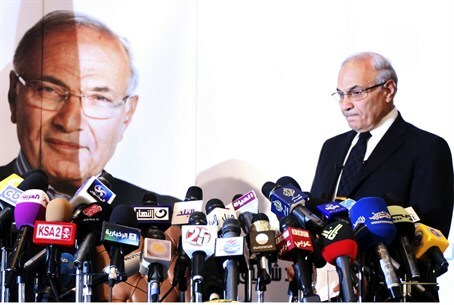 Sources at the Presidential Electoral Commission would not confirm to the claims of a Shafiq win. Shafiq, who was deposed President Hosni Mubarak's last prime minister, repeated on Thursday his claim of victory in weekend runoff elections. He accused the Muslim Brotherhood, whose candidate ran against him, of “playing games” to put pressure on election authorities before announcement of the official results. He also accused the group of striking “backdoor deals” with outside powers to sway the results and urged world capitals not to interfere. The Brotherhood also declared soon after the election that its candidate, Mohammed Morsi, had won. The commission said it won't release the results till at least the weekend, and possibly even later.